Histone Modification ELISAs provide a simple, sensitive method for detecting changes in histone acetylation levels from purified core histones or histones isolated by acid extraction. For added convenience and a more quantitative interpretation of results, the Histone Modification ELISAs also include acetylated recombinant histone protein for use as a reference standard curve. For complete details, click the ELISA Method tab below. Histone H3 lysine 27 acetylation (H3K27ac) has been identified as a mark of active enhancers and active promoters. The Histone H3 acetyl Lys27 ELISA is a sandwich ELISA for screening the levels of histone H3 acetyl Lys27 in your samples. The detecting antibody is specific for acetyl Lys27 and will not cross-react with other modifications, enabling small changes in acetylation levels to be detected. Click on the H3K27 Info tab below for data and more information. The acetylation of lysine 27 on histone H3 (H3K27ac) has been correlated with active enhancers and promoters, making acetylated lysine 27 on histone H3 a significant marker in studying the state of transcription activity. 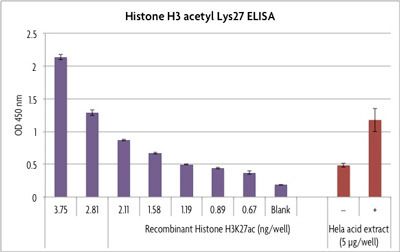 The Histone H3 acetyl Lys27 ELISA is capable of detecting the level of histone H3 acetylated at lysine 27 from core histone preparations or histones purified by acid extraction from tissue or cell samples (Figure 1). The Histone H3 acetyl Lys27 sandwich ELISA assay is also tested for cross-reactivity with other site and degree-specific recombinant proteins as shown in Figure 2. Figure 1: Histone H3 acetyl Lys27 ELISA (H3K27ac). The Histone H3 acetyl Lys27 ELISA was used to assay HeLa acid extracts (5 µg) that were either untreated (–) or treated with sodium butyrate (+), a known HDAC inhibitor. The provided Recombinant Histone H3 acetyl Lys27 protein was assayed from 0.67 - 3.75 ng/well as a reference standard curve. Data shown are the results from wells assayed in duplicate. These results are provided for demonstration only. 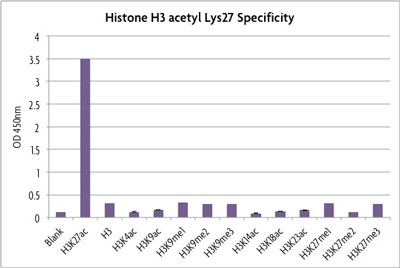 Figure 2: Specificity of the Histone H3 acetyl Lys27 ELISA (H3K27ac). To verify the specificity of the Histone H3 acetyl Lys 27 ELISA, 100 ng of recombinant histone H3, mono-, di- and trimethyl Lys9 and Lys 27, and acetyl Lys4, Lys9, Lys14, Lys18 and Lys23 proteins were assayed per well. These results show the assay specifically recognizes H3K27ac. There is extremely low background from histone H3 and no cross-reactivity with the other methylated or acetylated histone modifications. This means that small, specific changes in acetyl Lys9 levels can easily be detected with this kit. Included in each Histone Acetylation ELISA is an acetylated recombinant histone protein made using Active Motif's patented protein synthesis technology. Likewise, included in each Histone Methylation ELISA is a methylated recombinant histone protein made using Active Motif's patented protein synthesis technology. These included proteins can be used to build a reference standard curve to quantitate the amount of either specifically acetylated or methylated histone H3 (respectively) in your samples. Click on our link for more information on our patented protein synthesis technologies and to get a complete list of our Recombinant Histones and Modified Histones. The Total Histone H3 ELISA includes an unmodified Recombinant Histone H3 protein. Each Histone Phosphorylation ELISA contains treated and untreated acid extracts for use as a positive and negative controls. Why use the Histone Methylation, Histone Acetylation and Histone Phosphorylation ELISAs? The Histone ELISAs to detect acetylation levels on histone H3 are sandwich ELISAs that utilize a monoclonal histone H3 antibody to capture histone H3 from purified core histones or histones isolated by acid extraction from tissue or cell samples. A polyclonal antibody specific for the modification of interest is used for detection, while a secondary antibody conjugated to horseradish peroxidase (HRP) and developing solutions provide a sensitive colorimetric readout that is easily quantified by spectrophotometry at 450 nm. The assay is performed in a convenient 96-stripwell plate, which enables either low or high throughput screening.